Company name: Quest Software, Inc.
Quest QoreStor is a software-defined storage platform designed for any IT organization looking to accelerate backup performance, reduce storage costs and leverage the cloud for disaster recovery, archiving and business continuity. QoreStor is the evolution of Quest's proven DR Appliance deduplication and replication technology, adopted globally across 1000’s of users of all sizes from all industry verticals. QoreStor is installable on a single physical node, a VM on any hypervisor or deployed in any public cloud. QoreStor can scale-out to meet the capacity and performance demands of modern hybrid IT data centers supporting direct-to cloud backup as well as cross-instance replication. 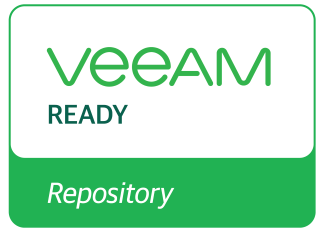 QoreStor Rapid Data Access (RDA) drivers, installable on Veeam backup servers and Veeam backup proxies, with support for Windows and Linux enable source side deduplication, encryption and WAN resiliency. RDA is part of the all-inclusive QoreStor license and is critical to a high performing Veeam QoreStor Repository implementation.